This article was written in 2009 and remains one of our most popular posts. If you’re keen to learn more about copyright, you may find this recent article on copycat startups of great interest. Is Using SVG Images Good for Your Websiteâ€™s Performance? The vast majority of websites have a copyright notice in the footer. Most designers do this as routine on all websites they design. But what exactly does it mean and what protection does it provide? This is vital information for web professionals to know. Here are answers to some common questions related to copyrights. Please note: This information is based on copyright laws in the U.S. as provided on www.copyright.gov. It is provided as general information and is not a substitute for professional legal advice. How Can I Copyright a Website? Original work is copyrighted from the moment of creation, provided itâ€™s fixed in tangible form. What does â€œfixed in tangible formâ€� mean? This means that the work has to be documented or communicated in an observable way, either directly or through a machine or device. Some examples of fixed in tangible form include written on paper, saved on a hard drive, or captured on a recording device. Ideas, systems and methods cannot be copyrighted. A website — graphics, content, visual elements — is copyrighted at the time of development. So putting the copyright notice on the bottom of a site states that the material displayed is not to be used without permission of the owner. In fact, you donâ€™t even need the notice to claim copyright; the law eliminated the requirement of public notice in 1989. 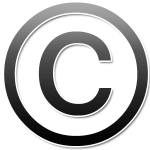 To take this one step further, copyright registration is an option when protecting online works. Registering a copyright provides a public record of ownership, plus registration is necessary before filing an infringement suit in court, should you ever need to do so. You can register online or by mail, by providing an application, a non-refundable fee (which is currently $35 for online registration), and a non-returnable deposit. The deposit is the entire work to be copyrighted (i.e. the website), which can be uploaded or sent in via CD. This is important to note: the registered copyright only extends to the works included in the deposit. If you update the website after filing the copyright, you will need to register again for the new material. There are two cases (databases and serials/newsletters) where, if you meet the requirements, you can register in three-month chunks, with the copyright covering three months at a time. See Circular 62b for more information serials and newsletters, and Circular 65 for more information on databases. Please note: At the time of writing this, Circular 65 was being revised and was unavailable. Generally, the creator owns the rights to the work, except in the case of a â€œwork for hireâ€� arrangement, such as an employer/employee relationship. If youâ€™re a freelancer or business owner hired to create a specific work, you are considered the creator and retain all rights, unless you have a “work for hire” agreement with the client that grants them ownership of the work. These details should be negotiated and outlined in your contract for every job so there is no question about ownership. This paragraph has been corrected from the initial post which misstated the designer’s rights. Does a Copyright Extend Internationally? There is not a world-wide copyright, but many countries adhere to international copyright treaties and conventions for foreign works. Review Circular 38a for a list of countries and their copyright laws. For more information on copyrights, how to register and current fees, visit www.copyright.gov. If you enjoyed reading this post, you’ll love Learnable; the place to learn fresh skills and techniques from the masters. Members get instant access to all of SitePoints’ ebooks and interactive online courses, like Build a Successful Web Design Business. Comments on this article are closed. Have a question about copyright? Why not ask it on our forums?